Brand reputation management should be – and probably is – an important part of your marketing strategy. But having control over what happens in the online environment can prove to be more challenging than anticipated. Customers and competitors are just as visible, and so is what they say about you. How you handle pleasant and less pleasant situations regarding your brand’s image is another topic however. What I want to talk about today is how you can monitor your brand reputation in search results, and get an extensive and actionable view of how you “look” in SERPs. I’m going to showcase an AWR Cloud project we built for this particular case. I hope it will give you some nice insights on how to get the most out of your rank tracking projects, with minimum keyword unit consumption and the least amount of effort. 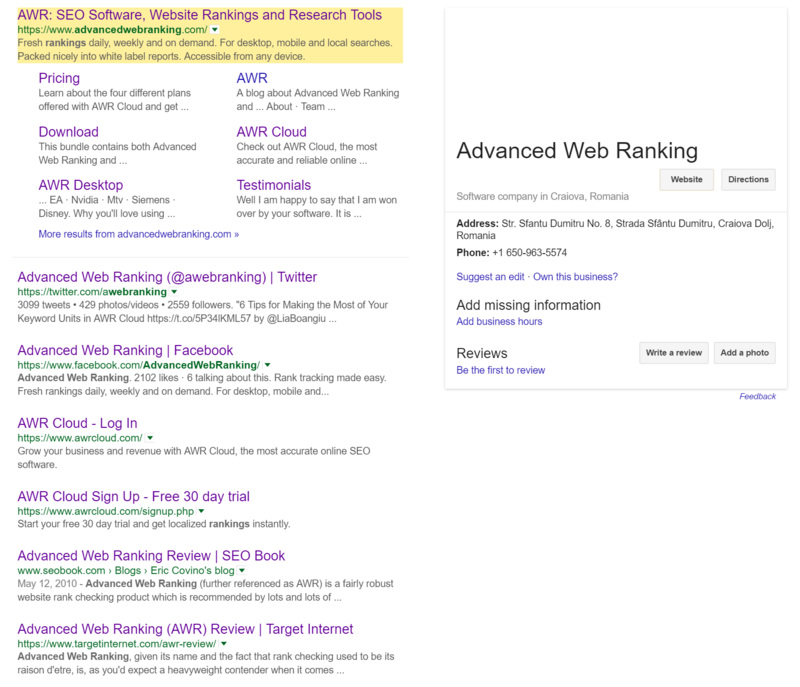 In this example I use our own website – advancedwebranking.com – and Google as search engine, but you can adapt the same project to any other website or search engine from the 3000+ list of search engines supported by AWR Cloud. 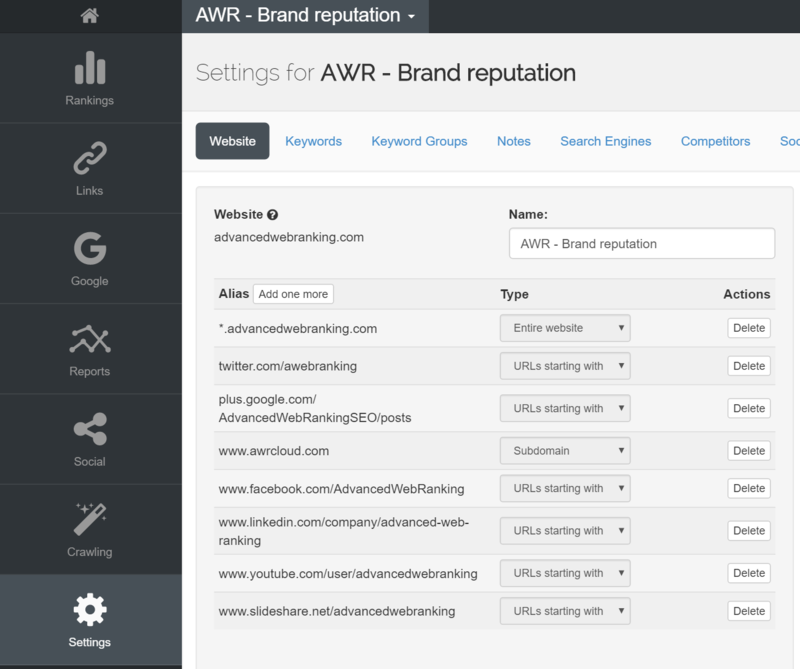 Rank tracking in AWR Cloud requires minimum three essential inputs: your website, a set of keywords and a set of search engines. Having already decided on using our own website and Google, all we needed to get started with our brand monitoring project was the set of branded keywords to track. We needed to make sure that we found all our most important brand terms, so we relied on both Google Search Console for the keywords that drove people to our website, and on additional keyword research to discover terms that we might have no visibility for. Although Google does not automatically isolate brand keywords in Search Console, you can easily apply filters to their list or, even better, if you’re really zealous about this, you can go through the list and manually select all branded queries. When expanding this list, make sure you also include competitive terms like “review”, “comparison”, “alternative”, “discount”, etc., or any other keywords that are relevant for your business. Ubbersuggest, Keyword.io or other similar tools might come in handy in this process. Brand terms come in different flavours. The biggest mistake you can make is to treat them all the same. As with all search queries, depending on the intent behind each branded search – navigational, informational or transactional – you need to deliver content about your brand as befits. So, lining up your keywords by search intent is a vital step of this process, that should enable you to perform a coherent analysis of your brand reputation in search results and to develop well-suited strategies for each category. Brand name – this includes our brand name and abbreviations with no associated intent (advanced web ranking, awr, awr cloud, advanced web ranking app etc). The keywords in this category help us measure the sentiment associated with our brand. Features – keywords composed of brand name/abbreviations and different features of our application (advanced web ranking api, advanced web ranking reports, advanced web ranking competitor analysis, etc.). Support – keywords used by our users when searching for answers about using the app. The keywords in this category can easily overlap with the “Features” category, since the intent behind these terms is broad. 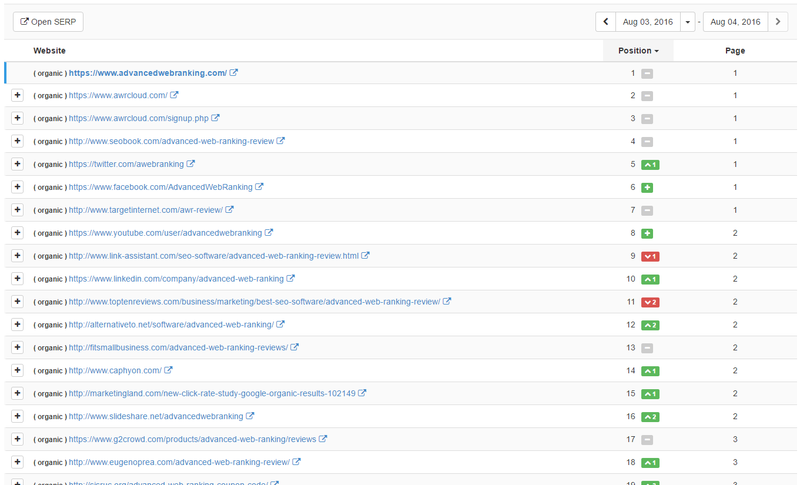 For example, an user searching for “advanced web ranking reports” may be interested in finding out more info about our reports (Features category), or may be just as well looking to get unstuck building an AWR report (Support category). Purchasing – keywords with purchasing intent (buy advanced web ranking, advanced web ranking black friday, advanced web ranking free, advanced web ranking discount coupon, etc.). Competitive – branded keywords specific for the evaluation phase in the buyer’s journey (awr cloud vs desktop, advanced web ranking review, advanced web ranking alternative, etc.). Complaints – keywords containing terms like “slow delivery” or “complaints”. One error lots of marketers make when monitoring their brand reputation in search is to only track the performance of their website. This approach can limit you to an incomplete image of how your brand appears in search results, since you most likely have an online presence not only through your official website, but on social platforms of all kinds as well (Twitter, Facebook, LinkedIn, Instagram, Pinterest, etc.). All these are owned web properties through which you can intentionally build reputation. You need to lay out the list of all web properties that you rely on in the online space to distribute the correct message about your brand, and add them to your list of tracked URLs in AWR Cloud, along with your website. Adding all these URLs as website aliases in our AWR Cloud project tells the app that whenever any of these URLs is found in search results, the app should treat it as if it were the main website. 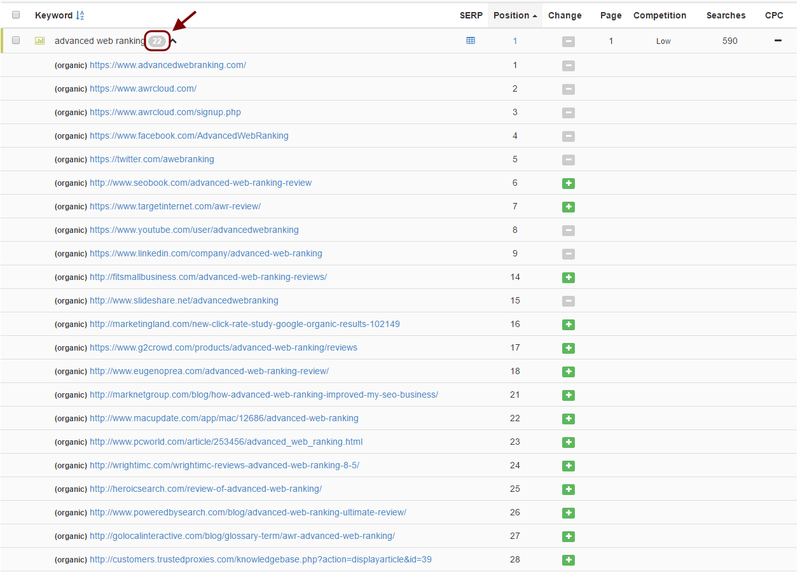 Consequently, we will be able to see the rankings of all these URLs in the same project and under the same report. if you are not sure what option to select from the “Type” drop-down list, use “Custom value”. When reloading the page, AWR Cloud will automatically set the correct Type for you. After getting all inputs together for our AWR Cloud project, we start tracking just how much SERP property we’re covering for branded queries. We’ll be calling this metric, brand density in SERP. The more listings we own in a SERP, the higher our brand density will be. However, when we look at the SERP for our brand name “advanced web ranking”, we are interested not only in having as many owned listings as possible, but in seeing that there are predominantly positive listings about our product. Tip: While in Keyword Ranking view, select “All URLs” from the top-left drop-down list to display all ranked URLs for each keyword. The screen above is taken from our search reputation monitoring project where we track rankings with a 10 pages depth. That means that among all first 100 search results, we own only 8 of them. At first you might feel that this is bad, but let me give you another example that proves just the opposite. Although the numbers are high, this is far from an ideal situation. You can see all sorts of pages ranking, from blog articles to technical documentation and our contact page. Since all these results are pages from our website that serve no specific intent, we can rather say that Google didn’t find any other relevant pages to serve for this query other than our own website pages. So it used them to fill up the SERP. This means that outside of our users, people simply don’t use “AWR Cloud” enough when referring to our product online. So then, what would be the best density? To answer this question, we need to go back to the “advanced web ranking” keyword. If our own website and properties cover only several positions from the SERP, we need to find out who is listed for the other positions. But the SERP is only informative, and we cannot take any actions from this screen. 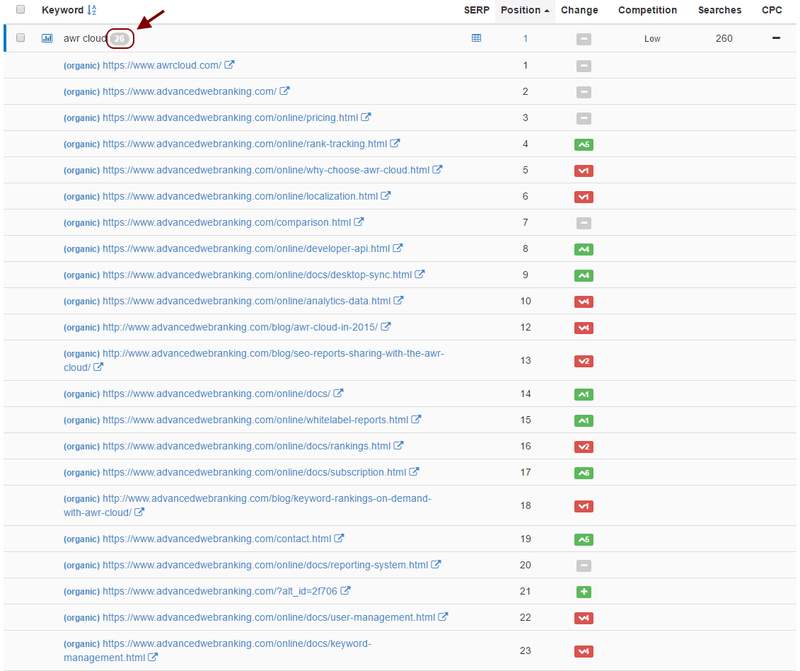 A better option is to open the Top Sites report for this keyword and analyze the rest of the listings there. Since the best reputation is built through user feedback, it is ideal to have SERPs filled with as many positive brand mentions as possible, from websites you have no control over. For us, some of these listings are favorable reviews and tutorials made by industry peers (colored in green – see the screenshot below), and some are not-so-favorable pages built by competitor websites (colored in red). Owned URLs are colored in yellow. To be able to asses, in one view, just how much from this SERP is supporting our brand, we are going to manually review each site and add all favorable reviews and listings as aliases for this project. And so, from the mere eight owned listings in top 100 we saw earlier in our Rankings report, we now see 9 positive listings for our brand out the first 10 results, 14 out of the first 20 and 22 out of the first 30 search results. Much better, right? As for those negative listings that you wish to keep an eye on, you can add them to monitoring directly from the Top Sites report. Keep in mind that you can use the same tweak we used for our main website for competitors, and add their social profiles and online listings as aliases. Thus you’re able measure your competitors’ density in SERPs under one unique umbrella. 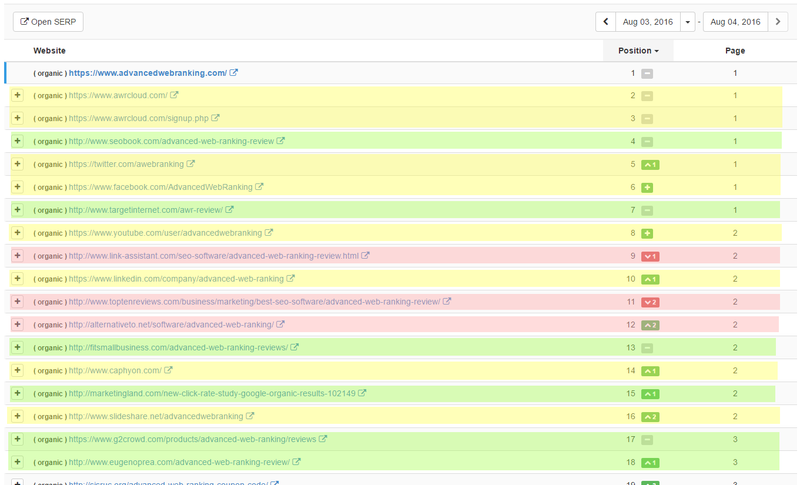 As you can see, brand monitoring is not that complicated or time-consuming once you’ve got a system in place. But it does require a strong foundation, such as keeping your strategy goals in mind, knowing what your brand (and related products) is about, and who your competitors are. You require a complete grasp and knowledge of the keywords that your brand is associated with, not just those branded terms. Then you can gather them all in one place and, with the help of tools like AWR Cloud, monitor them regularly – how often depends strictly on your market. If you’re an AWR user, I’m curious to know whether you’ve used this, or other similar methods, to monitor brand reputation. If you’re not a user, what alternatives do you have, and what tactics are you employing? So glad you found it interesting, Marcus. And thanks for posting this question. All aliases I’ve set for this project were set as “Custom variable”. In the screenshot they appear as “URLs starting with” or “Subdomain” because the screenshot was taken after I saved the changes, and that’s when the app automatically classifies each alias as it sees fit. When adding website aliases in AWR Cloud, it is recommended to choose the “Root domain”, “Subdomain”, “URLs starting with”, “URL exact match” options only in relation to the domain you have created the project around. If the alias is from a different domain, choose “Custom variable”, and the app will adjust the type accordingly after saving. hi dana! so I am glad that I’m not a dummy 🙂 thanks for your answer and thanks again for that cool and inspiring article! Not at all, your observation was spot-on! Thanks again for trying it out and for your feedback.